I recently picked up a copy of Red Pine’s translation of Guide to Capturing a Plum Blossom, by Sung Po-jen, first published in 1238. Not a typo–this was written in China almost 800 years ago. The concept: 100 paintings of plum blossoms in varying stages, from Covered Buds to Forming Fruit. Each painting is accompanied by a poem that refers to the plum blossom’s physical appearance, as well as many layers of associated cultural and political symbolism. Really, some quite lovely political critiques. Sung Po-jen was clearly obsessed with revealing the essence of his subject, and he was so successful that later painters didn’t bother to study the real thing anymore–they just memorized his book and its 100 stages. 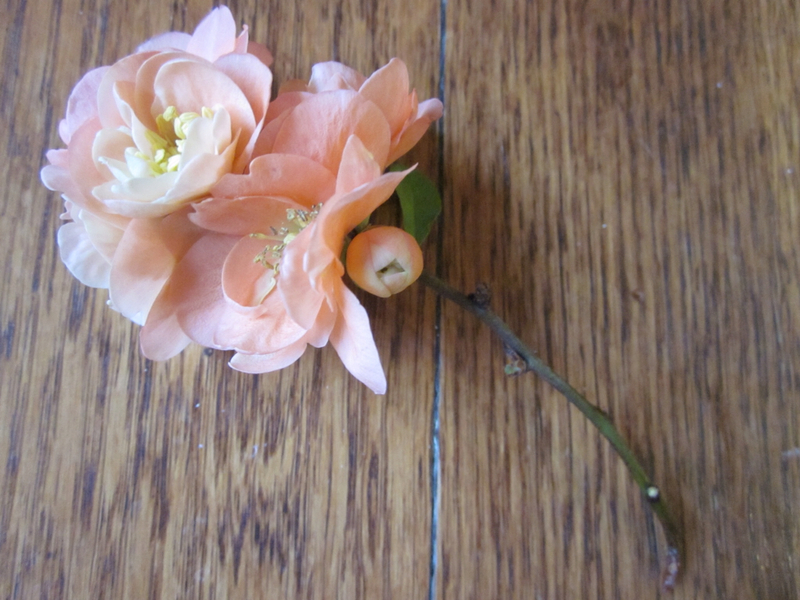 Reading this book has made me look at my flowering quince’s ruffled, peach-colored blossoms with new eyes. And crying Don’t hurt me. And I’ll see. — What?